I got bitten by the artsy bug this morning and nothing could console me until I had upturned our place, rooting through boxes of art supplies in search of paint chips (which I ended up not using after all). My brainstorming was a bit scattered today. I scrawled out a list on scrap paper, in bright pink pen. 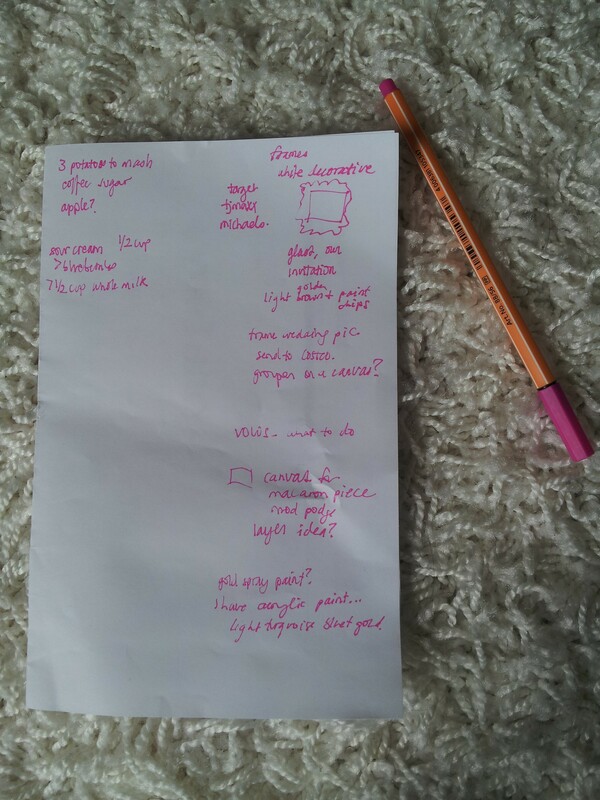 The left side is a grocery list of things for a shepherd’s pie, blueberry scones, and other random items. The right side is a mish mosh of frame types I wanted to purchase at Michael’s/TJ Maxx/Target combined with loose project ideas involving frames. 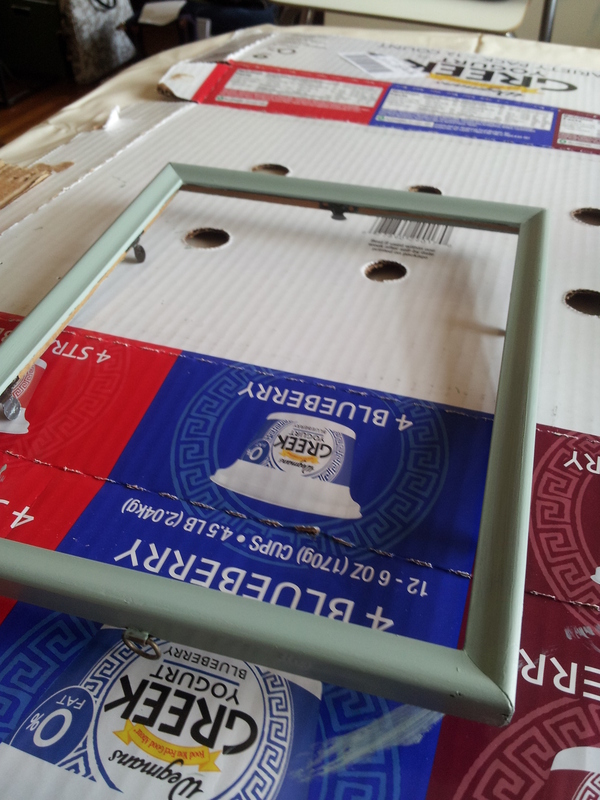 My grand plan was to take some paint chips, cut them accurately, and array them in a frame. All of that didn’t happen, but at least all my Pinteresting from this morning’s session didn’t go to waste! That project will still be there for another day. 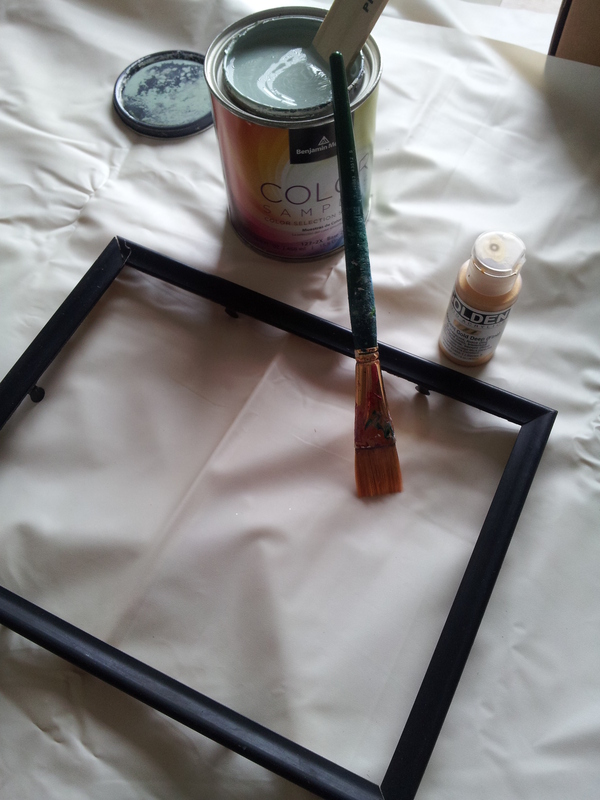 Follow NINI4NANA’s board DIY for Home on Pinterest. It’s been almost a year (!) since we’ve gotten married, and we have yet to put up anything wedding related on our walls. No pictures, no collages, etc. I’ve wanted to do something with our program, which a friend of ours put together for us so simply and elegantly, but haven’t yet. The front side of our program has the usual sorts of info: our names, the date, our parents, bridesmaids and groomsmen, and a thank you to our guests. 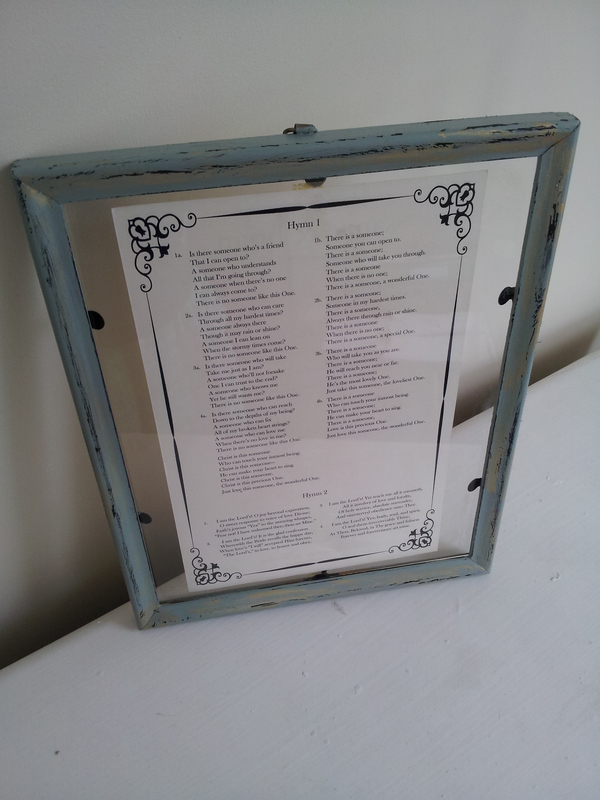 The back side, which is the side I am displaying in the frame, holds our two hymns from our ceremony. They’re quite lovely and inspirational, yes? 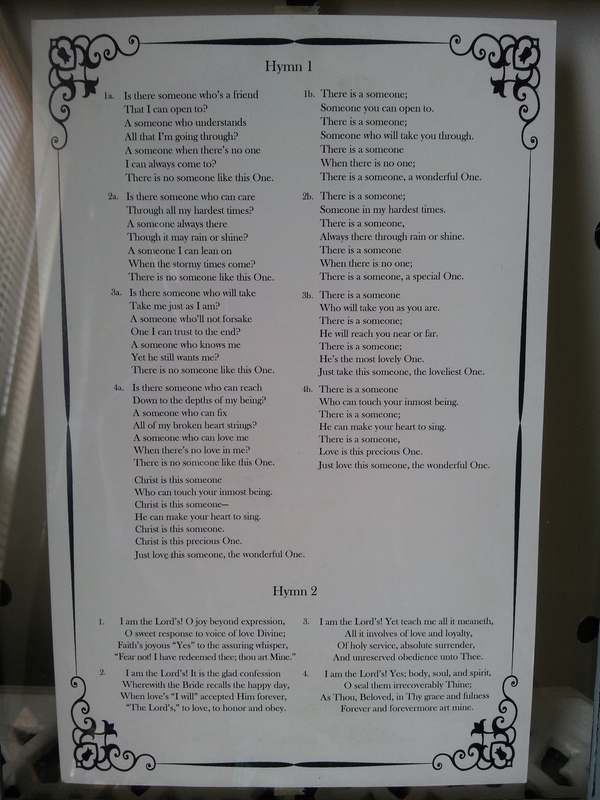 I found this frame on the side of the road near my in-law’s home last year, during spring cleaning, I suspect. They (there were a few), sustained the move to our present abode and a few transfers from paper bag to paper bag. 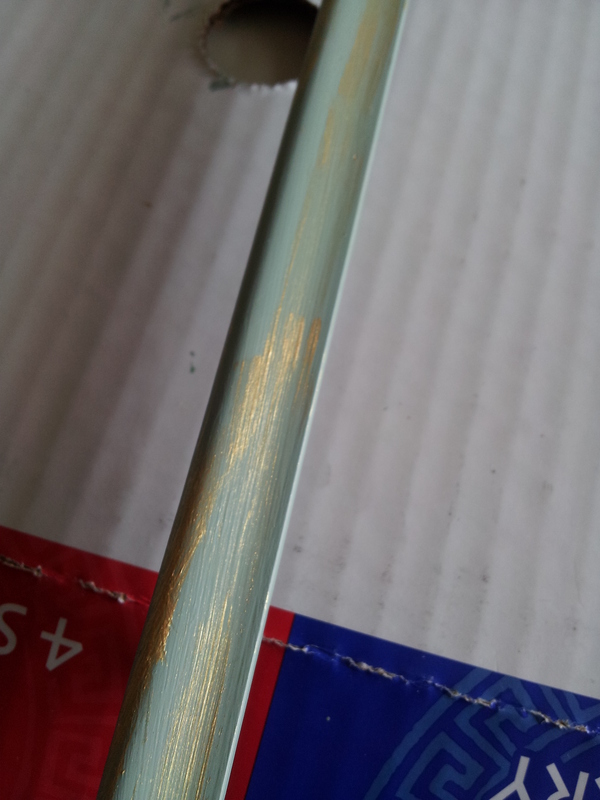 I dusted off and cleaned the only one with glass in it and remembered I had some paint for wood in a super cute color that had been untouched thus far. A project was born! I set up shop in the kitchen, using an old shower liner I washed in the washing machine as my Craft Mat and went to town. Step 3: Distress selectively with sandpaper. Step 4: Put it all together. 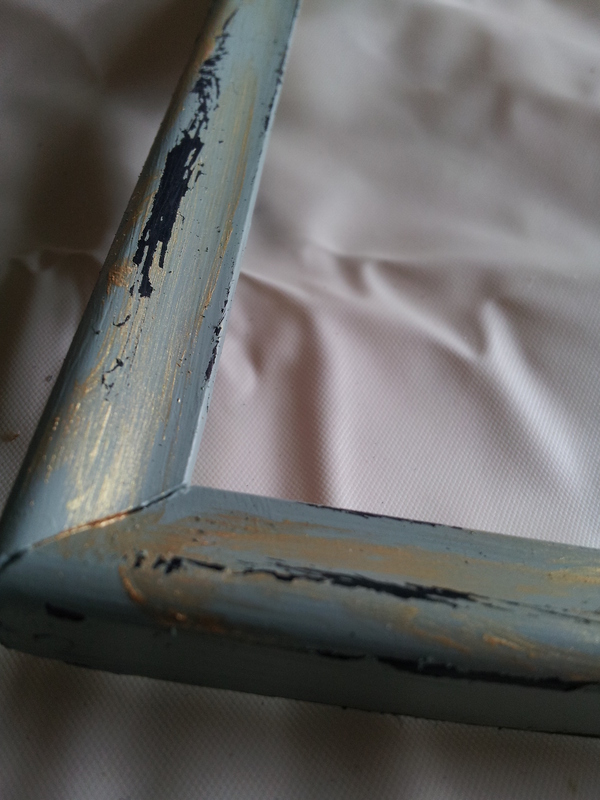 Isn’t the black in the program offset so nicely by the distressed black from the original paint of the frame? Voila! 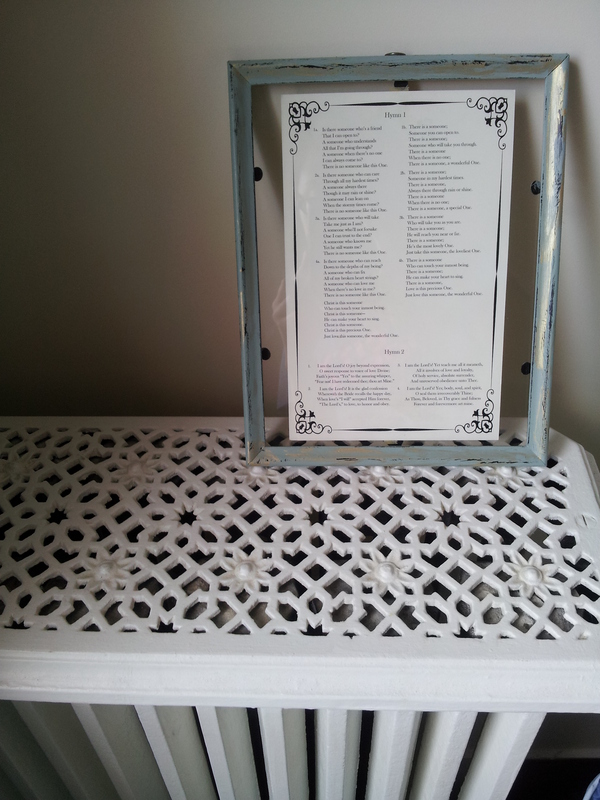 It’s sitting on top of a vintage radiator with a lovely lattice print at the moment. Quite nice! 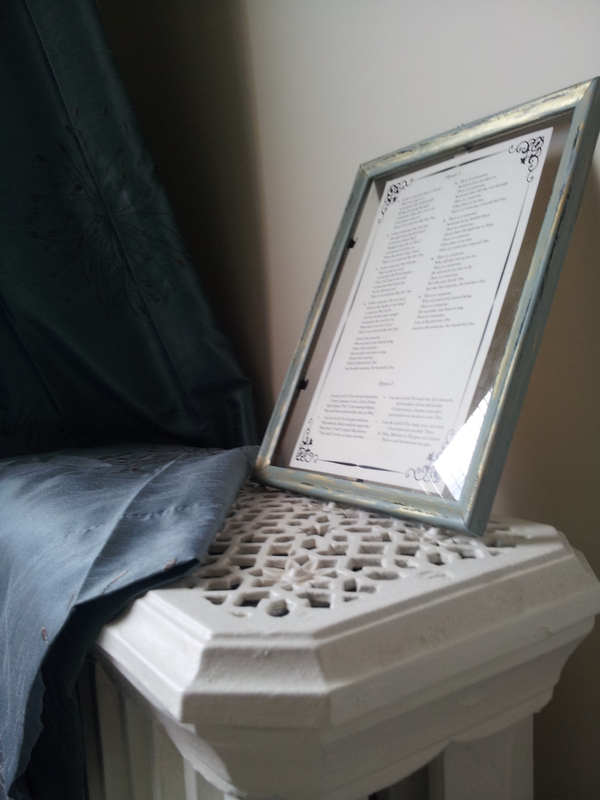 If you’ve been in the same boat as I have as a newlywed, or are planning on making some commemorative decor DIY from your wedding, I hope that this inspires you and gives you a suggestion. In any case, I hope you enjoy reading this post. 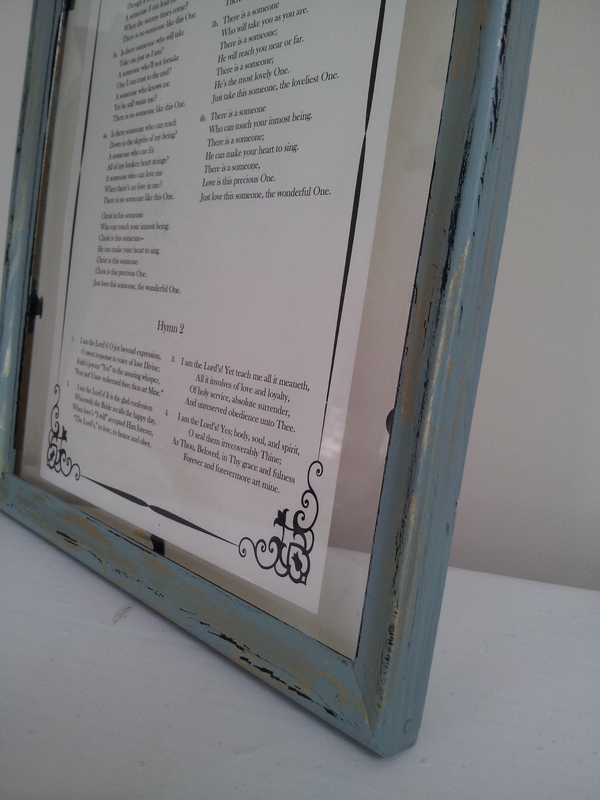 Tags: aqua and gold, artsy and loving it, create, distressed wood, DIY, frame, hymns, inspiring, newlywed, quick project, Spiritual, upcycled, upcycled DIY, wedding blog, wedding diy, wedding program. Bookmark the permalink.